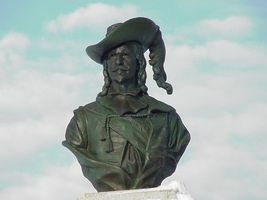 GRAVÉ DU PONT (also called Dupont-Gravé, Gravé Le Pout, Pont-Gravé, or simply Le Pont or Gravé), FRANÇOIS, “noble homme,” a captain in the navy, in command at Tadoussac in 1603, at Port-Royal in 1605–6 and at Quebec in 1619–20; b. c. 1554 at Saint-Malo; d. in France sometime after 1629. Gravé Du Pont had borne arms before becoming a merchant. He came up the St. Lawrence to trade furs at a very early date, reaching Trois-Rivières before 1599. Champlain credits him with playing a decisive role in obtaining the trading monopoly for Pierre Chauvin de Tonnetuit, which explains the fact that Troilus de La Roche de Mesgouez, feeling that his rights had been encroached upon, accused François Gravé of betraying “all those traders from Saint-Malo who had been his partners.” In 1600 Gravé Du Pont left Saint-Malo to take up residence at Honfleur. In the spring of this same year, he sailed for Tadoussac with Chauvin. He would have liked to go farther up the river, but his partner refused to do any exploring. In 1603 we find Gravé Du Pont in the service of Aymar de Chaste, the new holder of the monopoly: the latter was in charge of the expedition, which Champlain had joined merely as an observer, and brought out with him two indigenous people whom he had taken to France on a previous voyage; with Champlain, François Gravé ascended the river as far as the falls later called Saint-Louis and made a new inventory of the St. Lawrence River. After de Chaste’s death, Gravé became the deputy of the Sieur Dugua de Monts, the newest successful bidder for the trading rights. On his 1604 voyage he concerned himself exclusively with trading. 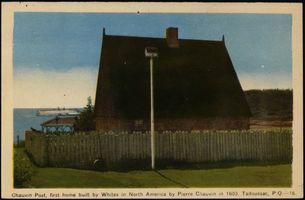 In 1605 he brought supplies to the Acadian colony, and along with Champlain he chose Port-Royal as the site for a new settlement; in 1605 and 1606, de Monts entrusted him with the command of the colony. 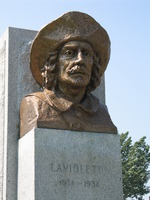 François Gravé Du Pont does not turn up in New France again until 1608 when, attempting to drive off the Basques who were trading despite prohibitions, he was defeated and wounded. In the autumn he returned to France, taking with him Duval’s accomplices in the plot against Champlain. From 1609 to 1618 inclusive, he came back to the St. Lawrence every year. 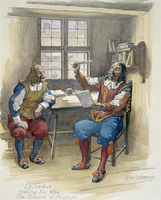 In 1619 the merchants joined together to name him Champlain’s replacement at Quebec; the latter protested “that as far as the Sieur du Pont is concerned, I am his friend & his age will make me respect him like my father: but as for agreeing that he be given what by right & in all reason belongs to me, I shall not stand for it. . . . The Sieur du Pont & I having in the past lived on friendly terms, I want to continue to do so.” Champlain was obliged to remain in France, and Gravé was in command of the colony at Quebec until the spring of 1620, when Champlain presented himself, bearing a commission naming him lieutenant to the viceroy. Another conflict occurred the following year. The trading monopoly now belonged to the de Caëns, but Gravé arrived in the St. Lawrence to traffic in the name of the former associates. Champlain attempted to negotiate, but Guillaume de Caën confiscated François Gravé’s ship and then, disillusioned, returned it to him. When the de Caën company was merged by the king with that of the former associates, Gravé Du Pont entered Guillaume de Caën’s service, working for him continuously until 1629. He passed the winter at Quebec in 1622–23, returned in 1624, and then spent the winter there again in 1625–26. Next Gravé, who was old, had experienced heart trouble in Acadia, and was suffering badly from gout (this ailment had been particularly violent in the previous few years), reappeared at Quebec in 1627, to the surprise of all. As a result of his long experience with the indigenous people, Gravé was an indispensable person; it was for this reason that de Caen had asked him to come back once more. He remained at Quebec until 1629, suffering both from the famine and from his gout. 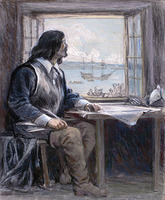 In the spring of 1629 Champlain wanted him to go down the river to Gaspé in a boat fitted with a bedroom and in the care of people who would look after him. Gravé at first accepted, but then changed his mind. He was still at Quebec, ill in bed, when it capitulated. Finally he set sail with the Jesuits for Tadoussac and thence to England. We do not know what became of him subsequently. His unwavering friendship for Champlain, his personal services to the Recollets, the assistance he sometimes gave in exploration when he was responsible only for trading, and his popularity with the indigenous people, all make Gravé a very likable character; according to Sagard he was “jovial by nature,” even if he did sometimes lose his temper, “drink his liquor straight,” and then roar for “relief from the pain of his gout.” Despite his age and his recurrent periods of illness, he astonished his contemporaries with his indomitable energy, which in 1606 earned for him the praise of Lescarbot in the latter’s Adieu aux François. Married to Christine Martin (who was still living in 1677), Gravé Du Pont had at least two children: Robert and Jeanne, who later married Claude Godet Des Maretz. Bréard, Documents relatifs à la marine normande, 65, 93–99, 100–34 (passim), 223–26 contains the inventory of all documents concerning Gravé Du Pont (no new ones have since come to light). Champlain, Works (Biggar), I, 125–65, 422n., 426, and n., et passim; II, 11–14, 32–35, 143–48, et passim; III, 24 ff., 177 ff., 228–230, et passim; IV, 361–66, et passim; V, 24–27, 39–48, et passim; VI, 29–38, et passim, Escrit of La Roche, quoted in Gustave Lanctot, “L’établissement du marquis de La Roche à l’ile de Sable,” CHA Report, 1933, 40. JR (Thwaites), I, 66, 76–80, “La conversion des sauvages”; 168–70; II, 26, 230; IV, 26. Lescarbot, Histoire (Tross), II, 426 f., 479–83, 521, 544–46, et passim; III, 17, “Les Muses de la Nouvelle-France.” Sagard, Histoire du Canada (Tross), I, 67, 243; IV, 859–61, 891. Research indicates that François Gravé Du Pont may have been baptized on 27 November 1560 in Saint-Malo, France, possibly the child of Robin Gravé and Guyonne Arthur. This parentage cannot be confirmed, however. Arch. Départementales, Ille-et-Vilaine (Rennes, France), “Reg. paroissiaux et état civil,” Saint-Malo, 27 nov. 1560: archives-en-ligne.ille-et-vilaine.fr/thot_internet/FrmSommaireFrame.asp (consulted 16 Oct. 2018). Marcel Trudel, “GRAVÉ DU PONT (Dupont-Gravé, Gravé Le Pout, Pont-Gravé, Le Pont, Gravé), FRANÇOIS,” in Dictionary of Canadian Biography, vol. 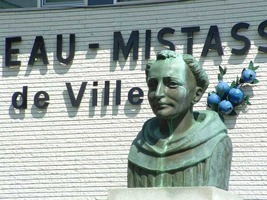 1, University of Toronto/Université Laval, 2003–, accessed April 23, 2019, http://www.biographi.ca/en/bio/grave_du_pont_francois_1E.html.